The Festival Hub will be the Walker Art Center. Home to contemporary art and so much more since 1927, it provides great spaces for daytime talks, workshops and labs. In 2005 a major expansion designed by Herzog & de Meuron was completed, resulting in aesthetically and technologically sophisticated facility. Amenities include a restaurant, a cafe, and various relaxing outdoor spaces including a sculpture park, plus a pretty satisfying bookstore if you dig design, art & architecture. We’ll be here 9-5ish everyday during Eyeo. Each evening keynotes and mixers will be held at different stunning venues around town. See below. *Bring your ID to check in. *Bring your ID to get your Eyeo Badge and appease to bartenders. We highly recommend booking your hotel as soon as possible. Several other big events are taking place in Minneapolis the same week as Eyeo and rooms are in high demand. 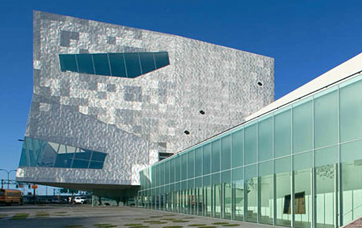 We’ve arranged block rates for Eyeo attendees at the two hotels convenient to the Walker Art Center. But just about any hotel downtown will be a good as any other in terms of proximity. Once you’re downtown just about everything is only a few minutes away by foot, bus, taxi or the groovy bike share system. DoubleTree Minneapolis – SOLD OUT. Hilton Minneapolis – SOLD OUT. If you’re still looking to book a hotel, any hotel in the downtown Minneapolis area is pretty close to the Walker. The Walker and Minneapolis Sculpture Garden are just across the street from to Loring Park, a large park that effectively serves as the southwest corner/edge of the downtown area. Evelyn is a coder and artist interested in the elegance of abstraction both in coding, as a way to describe complex software systems, and in painting, as a way to describe a personal, visual language. She also works on creative-coding toolkits that aim to elevate computer programming to the role of artistic medium by making coding more approachable, tinkerable and intuitive. Elliot is a digital media artist, technologist, curator, educator from Manchester UK. He creates provocations towards future interactions between humans and socio-visual design technologies (principally projectors, cameras and graphical computation). Towards this goal, Elliot co-founded Kimchi and Chips, an experimental art / design / technology studio based in Seoul.